Credit to Reign of Dragons for this awesome art. I don't think they were illustrating Tiamat, but She would approve. The All Father's consort, Tiamat, had a profound disagreement with the All Father when Time first moved. This disagreement was about his desire to abandon all of the dragon-created worlds and move to Heaven. From there, they would watch over creation and guide it. 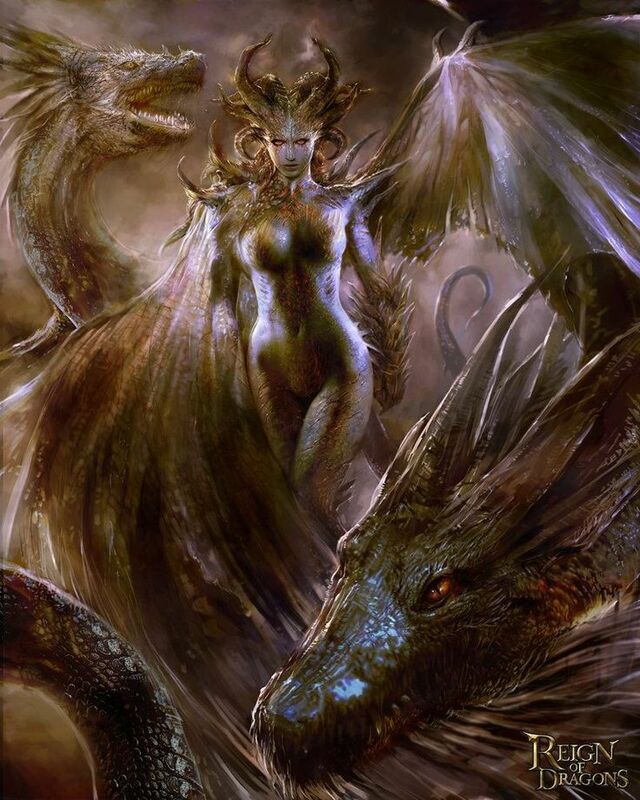 Tiamat wanted to stay and retain a more personal role in it given that most of Tehra was created by the dragons. She also felt that joining Heaven would diminish the role of dragons. In Her mind, the dragons were the gods and Pha Rann needed to abide by his own doctrine of gentle guidance. It became a war between the dragons and led to the aeon called the Dragon Wars. The Dragon Wars ended when Time began to flow consistently and the All Father retreated (Tiamat's doctrine) to Heaven along with the metallic dragons allied to his view. Though the Dragon Wars began as a philosophical debate, it became bloody at the end. Of those loyal to Tiamat, Alerius the Red burned the hottest and he formed an alliance of each breath weapon type. When the All Father's departure left them alone, Tiamat and her followers realized that taking Tehra - the last of the Nexus Gates - would lead to an eldar battle sure to destroy all. They schemed, but when Tiamat began to age in the current of Time's flow, their hearts broke and the patriarchs gave up their consorts to Tiamat to strengthen her and ensure she could take her own Nexal throneplane. Tiamat and the consorts attacked the Gate of Warp and took the 1st Plane as Tiamat's throneplane, now called the Silver Skies. Not as desirable as Tehra, it still gave them a sub-nexus. Among the eldar, the names of those joined to Tiamat are considered sacred and not to be spoken. The exception is Takhissis who is actively worshiped in Morbatten and whose name is almost interchangeable with Tiamat's. So, Tiamat is both a single entity and also a committee made up of the matriarchs of Red, White, Blue, Green, and Black dragons. When and if Shadow ascends, Teleris morbat Cor'tanos will have to give up his consort to Tiamat as well. Each of the matriarchs acts within a sub-dominion for Tiamat. For example, Takhissis is regarded as the fury and combat lust of battle, the vindictive cry for justice, and the glory of slaughter. Tiamat, by herself, is every bit the equal of the All Father with regards to her might. Tanians regard her as the supporting and creative force of the dragons, worshiping her for celebratory causes like the birth of a child or victory in combat. She is the marker of the milestone event rather than the goddess of the moment. The other matriarchal types fill those roles.